Earlier this week I took the SMART train to San Rafael to meet friends Donna and Margaret for lunch. Donna was driving up from San Francisco and Margaret lives just outside of the San Rafael city limits. Margaret recommended Sol Food, a Puerto Rican place with two locations, Mill Valley and San Rafael. 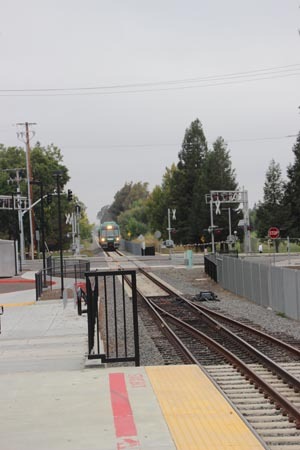 The Rohnert Park terminal is about fifteen minutes from my house. Since the only other time I’d ridden the train was when they were offering free rides, it didn’t occur to me that I’d have to pay for parking. Yes, of course it should have! Fortunately, ParkMobil has the contract, and if you have a cell phone they are easy to deal with. I have a ParkMobil account but I hadn’t brought my password with me, and I had a new license plate number anyway, so I called the number on the sign. It took about 3 minutes to have them update my info and charge me for parking; two dollars and change. 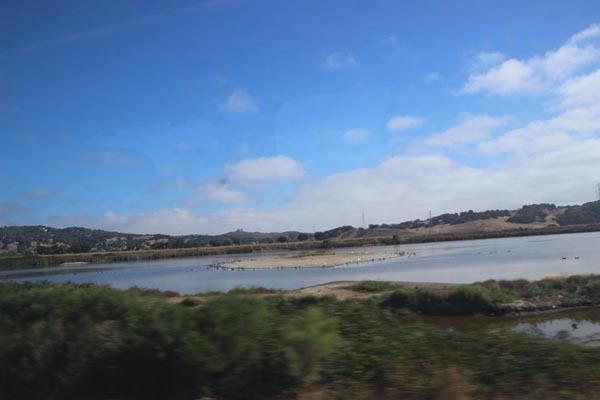 Wetlands and blue sky on the way to San Rafael. One thing makes taking the train, the ferry, and other Bay Area mass transit easy is a Clipper Card. It works like a debit card and you can load money onto it at almost any transit location or at Walgreen’s. There is a discount Clipper Card for seniors, and the website gives the directions. It works on BART, CalTrain, the SF Muni and the Golden Gate Ferry system. I took the last train of the morning, the 10:08 from Rohnert Park, because our lunch plans weren’t until 12:30. The trains are clean and in good repair, and my car was about half full. 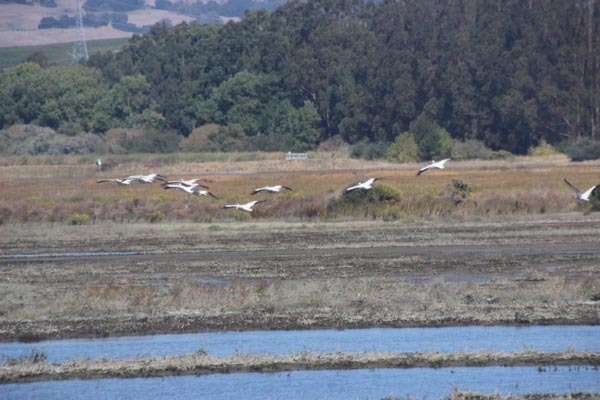 I sat on the side that meant I could see the wetlands in northern Marin County. I was also planning to write and brought a notebook. Since I chose a seat with the little pull-down tray, writing by hand was not a great choice. Others were using laptops and it looked much easier. Next time I may grab one of the four-seater bays with the table in the center. Sol Food is a landmark, beacon and purveyor of yummy Puerto Rican food. The ride lasts about fifty minutes. By the time I reached San Rafael the fog had burned away and I was facing a beautiful, warm, fall day. I had wondered about locating the restaurant, but its bright green walls and the oxidized tin roof make it a landmark, and it’s two blocks from the SMART terminal. 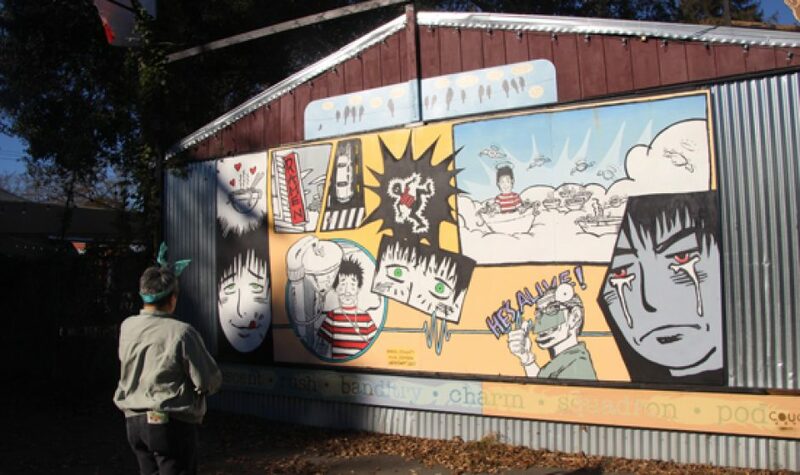 Once I located that, I walked up Lincoln Street to Fourth, to hit two of my favorite San Rafael places, Copperfields Books and RileyStreet Art Supplies. Fourth Street is the shopping street of downtown, filled with specialty shops, bakeries and eateries. 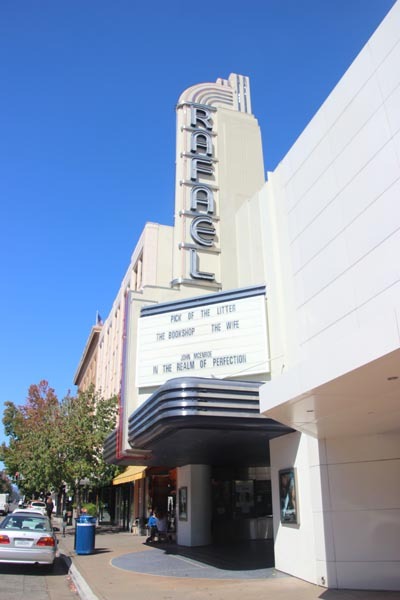 The Rafael Cinema looks like an art-house from the titles on the marquee. The Rafael has an art-house feel to it. 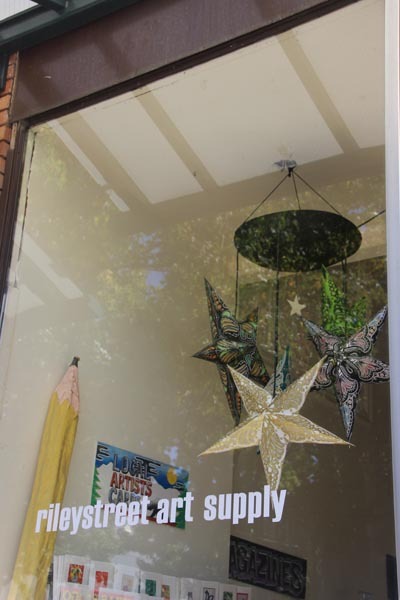 The Original Riley Street art store was on Riley Street in Santa Rosa. Eventually I wandered back to 3rd Street and Lincoln to meet Donna and Margaret. 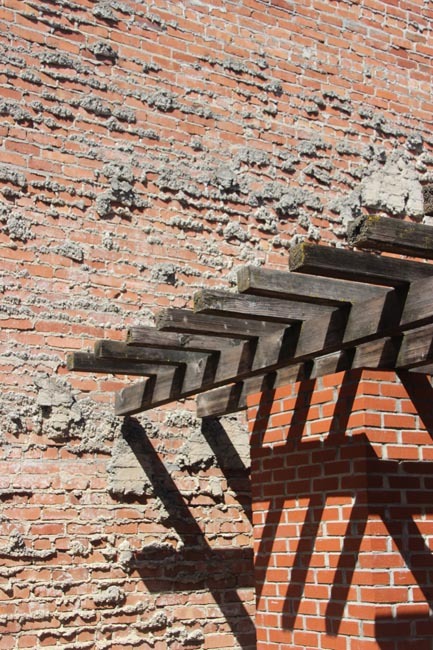 It’s just trellis and some bricks but I liked the textures. 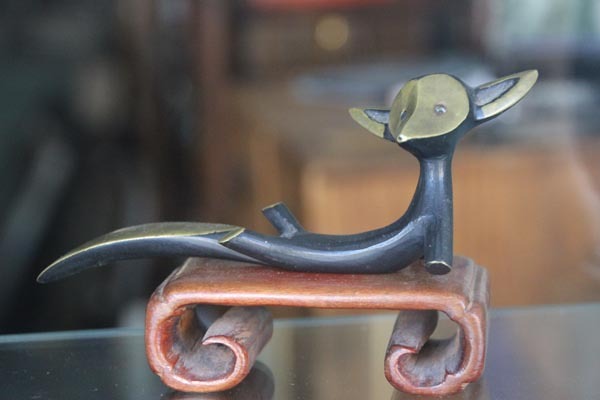 An offering in one of the Fourth Street Galleries. 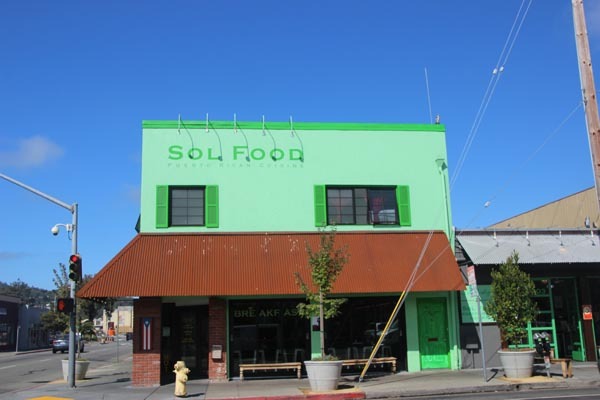 About Sol Food itself… the bright color of the building gives you one clue about the place. They have a to-go counter next door, and at 12:15 I had to squeeze through the line that had formed there. The sit-down restaurant was packed and noisy. Inside, cheerful colors and barn wood predominate. There are several community tables and we ended up sitting at one. We ordered at the counter, and our food came out quickly. A short description of the food—delicious. I had pollo al horno. The chicken was juicy and tender, the rice perfectly cooked, and the plantains stole the show, both the garlicky “plantain tortilla” and the soft, sweet yellow plantain. Donna and Margaret each has shrimp dishes. The flavors were wonderful and the portions large. 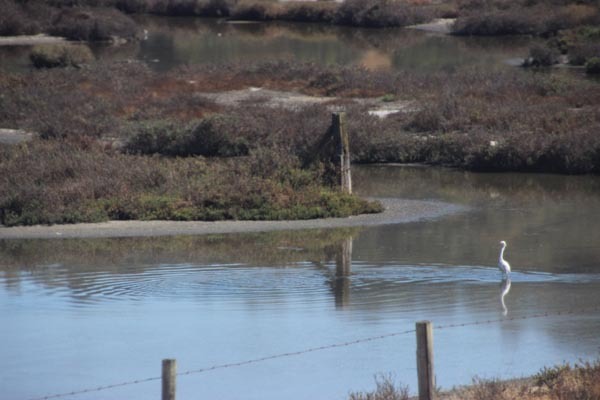 Angelo’s letter –quintessentially Marin County. Outside the front door, the owners have posted a handwritten letter they got from a San Rafaelian named “Angelo.” Angelo disapproves of the green color. 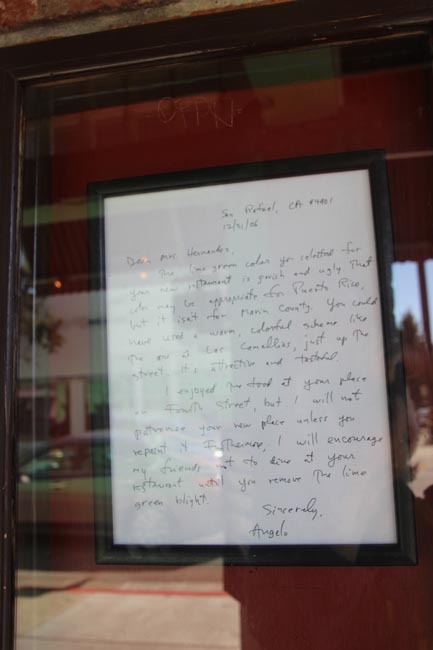 In his letter he states that it “…may be appropriate for Puerto Rico, but not Marin County.” He will never eat there again until they paint it a color he approves of, and he will tell his friends not to go there. Angelo, I hate to break this to you, but your boycott campaign is simply not working. It’s hard to compete with scrumptious food. I raise my eyebrows at bright colors usually, but the green makes the Sol Food building look like it’s in the tropics, which is how it should look. I recommend the food. Sol Food is noisy and not a good place for a quiet conversation, but they do have take-out. An egret looks for food. The three of us wandered back up to Fourth Street, drooled over all the books in Copperfields and had coffee in the Copperfields café. (Oooh, that conjures up an unpleasant image!) The San Rafael store is large, well-lit and reminds me of the old Berkeley bookstores in their heyday (it also reminded me of Elliott Bay Books in Seattle). They have a good selection although I could not locate the horror section. I didn’t ask because I was only mildly curious. We parted company and I caught the train back. There were more people at each station, this time many young people with bikes, which seems like a good plan. I was home by four-thirty. I’ll definitely do this again. I haven’t taken the train north yet; a ride to Railroad Square and back might be fun some fine autumn day. So fun to see you! But I’m now worried that the brightly colored scarf you gave Margaret may not have been appropriate for Marin County! Oh, my gosh! What if it isn’t? It’s so garish!